… a few questions & answers to help you get to know our missionaries better. 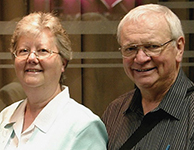 Dennis & Amanda Anderson share about life and ministry. Amanda: “The Hidden Hand” by J. Sidlow Baxter is a wonderful account of God’s sovereign hand at work in ordinary lives. I thoroughly enjoyed this true story. I also like reading “Christianity Today” online to keep abreast as to current events in the Christian scene, as well as “Just Between Us,” a magazine focused on helping women in ministry. Dennis: I spend a lot of time reading the Bible (my favorite book). I have read it through several times, and this year I am reading through it alphabetically, which makes for an interesting approach. What is your favorite sport/game to play? Amanda: I enjoy Scrabble, either with friends, or online. Sunday night, after a day of ministry, I love going online to play a game or two before the next week begins. Dennis: I love photography, and have a big collection of many beautiful pictures. Although I’m not one to enter them in contests, I think of some of them as “winners.” An interesting way of connecting with former students and friends of years gone by is to print photos of them to share with them. That has brought a fun way of re-connecting again. Those friendships of children in Sunday School are quickly encouraged by a picture of them in days past. I also enjoy keeping up with the local MJHL hockey team. When the team is playing at home, I often go to watch the game … a fun way of connecting with the community and keeping up with the team. Dennis & Amanda: Having been raised with a strong work ethic, and because of pride and a spirit of independence, it has been a difficult task to ask for and depend on others for missionary support for ourselves. Having said that, it has also been extremely rewarding to see God’s faithfulness. It has humbled us, and cut through our self-sufficiency as we have trusted God and His people to supply our financial needs. Dennis & Amanda: Because of one detail in an old “job description,” we have kept up the habit of breakfast together by 8 am. That is followed by devotions together using the “Daily Bread” devotional book, then praying together for our fellow missionaries using the NCEM prayer guides, as well as bringing personal, family, and ministry concerns before the throne of grace. We each have our own personal quiet times in the morning, as well as preparation time for future events, desk work, etc. One morning a week is scheduled for prayer with others at the church. Afternoons usually consist of more outreach – personal, visiting over an informal coffee or tea, or it involves the mundane responsibilities of housework, laundry, shopping, snow removal, gardening, ongoing maintenance, and so on. After supper there are usually church activities such as visitation, Bible study at the church, helping with ministry at the local Care Home, Youth Night, etc. Two evenings a week we do respite work with our nephew – driving him and entertaining him. He has been part of our ministry for 20 years. Everyday there are unscheduled events such as a call to come for a visit, a chat on the telephone, someone who calls with a burden, needing encouragement and prayer, unscheduled visitors, or neighborhood children coming for some attention or asking for a drink of water, a treat, or requesting to get their bicycle tires pumped up. These plans are scheduled by our Heavenly Father, and are not to be looked upon as interruptions, but as divine appointments. These are common in a missionary’s life. Can we trust His timing with these concerns? Dennis & Amanda: To leave behind a strong, growing, Bible-believing, vibrant church – one that proclaims a clear Gospel message; a church that loves the Lord Jesus Christ, and is an attractive light in drawing people of all ages and all ethnic groups to Himself, eagerly anticipating His imminent return. The Andersons serve at The Pas, Manitoba. (from Issue #536) Note: some of the locations and involvements of our missionaries may have changed since the original publishing of this article.